This article originally appeared in Wine Enthusiast Magazine, November 2017. Underground rare treasures, Alba truffles are harvested with luck, persistence and the aid of well-trained dogs. Find out how they transform Italian cuisine. In layman’s terms, the truffle is a tuber, a smallish, spongy subterranean lobe attached to tree roots. It’s technically a mushroom, but truffles are fungi grown symbiotically with rootlets of shrubs and trees like oak and hazelnut. A truffle spends its entire life underground until some lucky dog sniffs it out. Literally. White truffles are found almost exclusively in the Langhe, Roero and Montferrato areas of Italy’s northern Piedmont region, and only from October to early December. They enjoy cult status among chefs and gourmands, as a few of their flakes can elevate any dish. Since truffles are rare treasures, their market price is driven by very heavy demand. What happens when Italy has a dry summer? The average price, set daily at Alba Truffle Market, can skyrocket to more than $3,000 per pound. If anything, to find truffles requires luck and persistence. 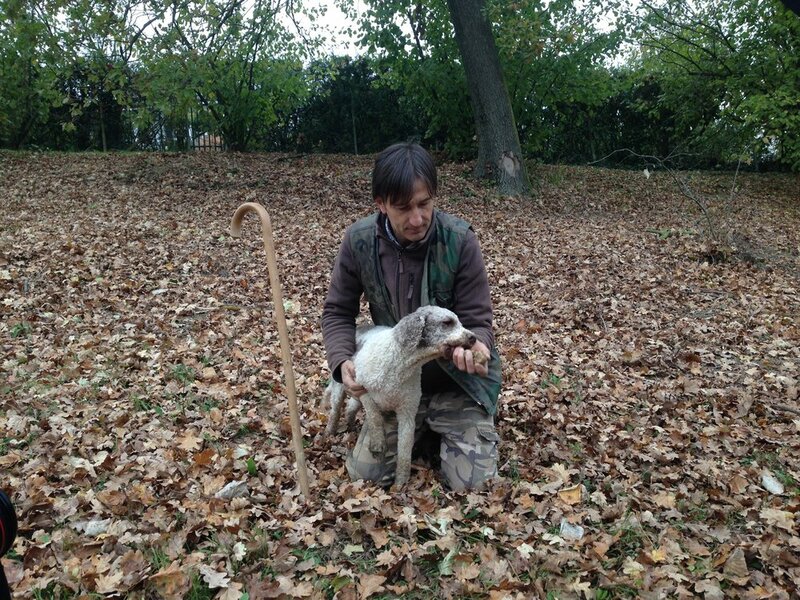 In Italy, the pursuit is left to the trifolau, truffle hunters whose techniques are passed down through generations. A truffle hunt is not a social event. It’s a solitary endeavor that require long hours in the cold night guided by moonlight and the nose of a faithful dog. Once the pup pinpoints the truffle’s location, the trifolau digs carefully around the area with a zappino (a delicate spade). They unearth the truffle, but leave a small portion in the earth to repopulate. To the untrained eye, the white truffle is nothing special. It looks an unwashed potato, light-colored, lumpy and dirty with a slightly elastic feel. It’s only when you catch a whiff of its intoxicating, transcendent scent that you understand that it’s special. There’s just one way to experience the sensorial pleasure of the white truffle: raw. Unlike the black truffle, whose flavor is unleashed when heated or cooked with other ingredients, the white truffle is best enjoyed shaved onto dishes like fried egg, tajarin pasta or beef tartare. For five generations, the Costa family has hunted truffles and shared them in simple, traditional recipes. Costa’s favorite is to add truffle shavings to a poached egg with melted fontina cheese. To accompany a truffle dish, he’s faithful to Piedmont’s red wines, particularly Barbera d’Alba, Barbaresco and Barolo. Sandro Minella, a sommelier, takes a different approach. A member of Ordine dei Cavalieri del Tartufo, or “knights of the truffle,” a prestigious order in Alba with 300 members worldwide, Minella doesn’t hesitate to suggest a Piedmont white. “The pairing is not with the truffle, but with the whole dish: sweet, savory, hot or cold,” he says. With fresh, fried or poached eggs, Minella prefers a white and advises against “anything acidic.” His top choices are Malvirà 2012 Trinità Riserva Roero, Gaja 2007 Gaia e Rey Chardonnay Langhe and Poderi Aldo Conterno 2010 Bussiador Chardonnay Langhe. To accompany risotto al tartufo or tajarin al tartufo, Minella chooses “something more structured, not too aged” like Scarpa La Bogliona Barbera d’Asti from 2010 or 2012. Minella says that meat dishes like tartar require something “richer, with some aging.” He pairs Barolo and Barbaresco wines because “their tertiary aromas are reminiscent of truffle, and go so well with them.” Wines that work include Paolo Scavino 2011 Rocche dell’Annunziata Riserva Barolo , Elio Altare 2004 Arborina Barolo or 2008, 2004 or 1999 Bruno Rocca Rabajà Barbaresco. Adding truffles to a dessert is not a traditional part of Piemontese cuisine, but chefs have been known to add shavings to handmade vanilla ice cream or a thinly gelatine persimmon purée. “When adding truffle, you want something harmonious, not too sweet or acidic, nothing extreme, something delicate and assertive,” says Minella, who suggests Paolo Saracco Moscato d’Autunno. White truffles are difficult to grow outside of Piedmont’s soil. Their bounty completely depends on Mother Nature, whose recent whims include a summer drought, leaving dogs with less to find and higher prices. Though truffles from Alba remain the most coveted at all, not just for their flavor but also their elusiveness, the best way to honor them is the simplest: shaved over a modest plate of pasta, risotto, or eggs.